Hammer Time 2016 in Jackson Co., Sat., March 26, 2016 * Let's Talk Some Turkey! ATTENTION Cattlemen! Farmers! Hunters! Farms #1, #2, #5 #6 Offered at $1,000 per Acre Minimum Bid! Farms #3 & #4 Offered at $1201 per acre Minimum Bid! 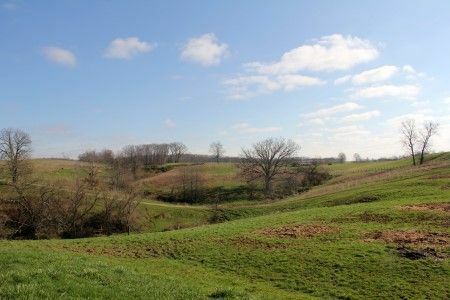 Breath Taking Views of Scenic Hills & Valleys * Pasture * Tillable * Wooded Acreage with Pond * Developed Spring Watering * Barn. Abundant frontage on SR 279. 3 Adjoining Parcels currently utilized as a cattle grazing operation and Hunting/Recreational property! Beautiful scenery all around with hill top views that go on and on. Farm #1: Approx. 115.68 Acres; $1,000 Ac. Min. Bid! 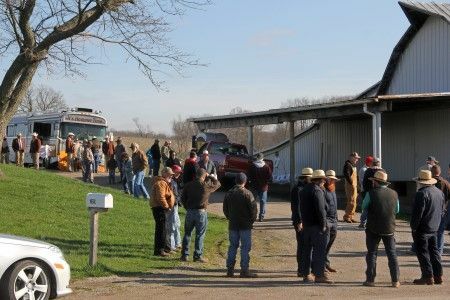 Cattle Farm located at 18476 SR 279 Oak Hill, OH. Pasture w/ fencing, pond, woodland, barn, tillable acreage, water tap and developed spring watering. Attention Deer Hunters! Rolling & Level acreage with vista hilltop views of the valley and abundant road frontage. Farm #2: Approx. 60.73 Acres; $1,000. Ac. Min. Bid! Pasture, hay ground, pond, developed spring. Cornering on Center Point Rd. & Coal Hill Rd, lots of frontage. Co. water at the road. Farms #3 (Auction Site) & #4 currently being surveyed contain total of Approx. 162 Acres. Farm #3: $1,201 Acre Min. Bid! 135 Thurman Rd. Oak Hill, OH * Adjoining Cooper Hollow Wildlife Area! Livestock Farm with 2 Story Home 3 bedrooms, 2 baths. Livestock barn with lean-to and hayloft, concrete feedlot & silo, auto unloading bunk feeding system, nice equipment storage building w/ 2 front, 2 side sliding doors, high ceilings, poured concrete walls between posts. Farm offers pasture w/ fencing, pond, developed springs. Scenic Views. Farm #4: $1,201 Acre Min. Bid! Mostly tillable situated directly across from Farm # 3, cornering on Thurman Rd. & Cherry Fork Rd. abundant frontage. Farm #5: Approx. 48 Acres; $1,000 Acre Min. Bid! Mostly tillable fronting on Thurman Rd., across from Farm 6. Farm #6: Approx. 115.59 Acres; $1,000 Acre Min. Bid! Cattle Farm Adjoining Cooper Hollow Wildlife Area! Fronting on Thurman Rd. across from Farm 5. Pasture w/ fencing, pond, developed springs, water tap, silo, 3 sided +/- 50’ by 140’ barn w/ high ceilings. Real Estate Terms: $7,500. down at time of sale cash/check with photo ID; Offered free & clear prior to closing; Balance & possession at closing on/before April 26, 2016; Sold in As-Is condition; No buyer's contingencies exist; All information provided is to be utilized strictly as a guide.